Follow instructions for invoking the HDL Workflow Advisor. 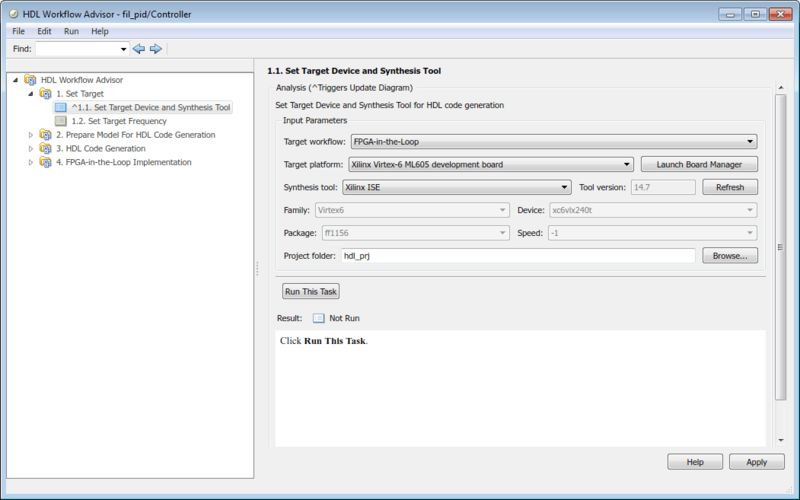 See Getting Started with the HDL Workflow Advisor (HDL Coder). You must have an HDL Coder™ license to generate HDL code using the HDL Workflow Advisor. 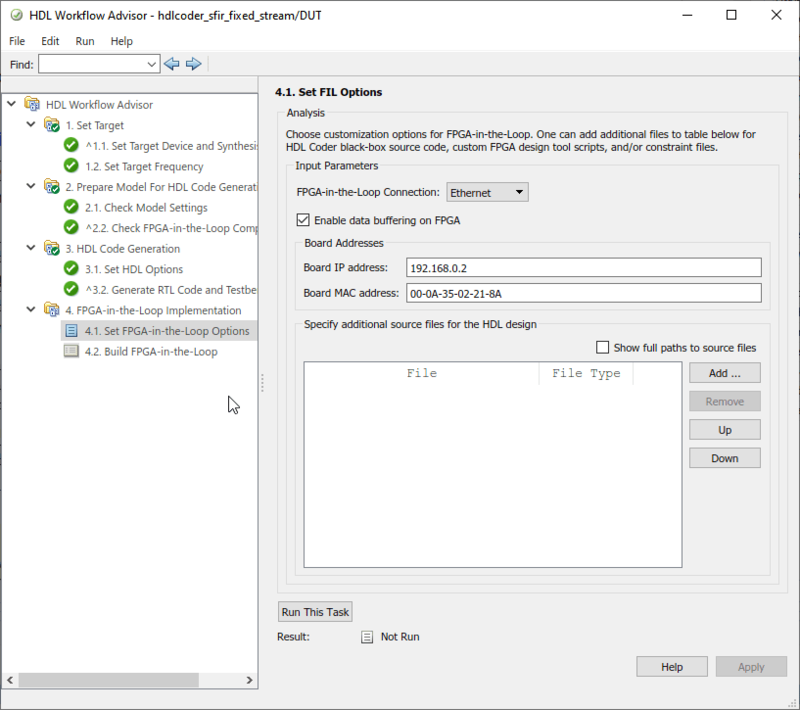 Select FPGA-in-the-Loop from the pull-down list at Target Workflow. Under Target Platform, select a development board from the pull-down list. Family, Device, Package, and Speed are filled in by the HDL Workflow Advisor. If you have not yet downloaded an HDL Verifier™ FPGA board support package, select Get more boards. Then return to this step after you have downloaded an FPGA board support package. For Folder, enter the folder name to save the project files into. The default is hdl_prj under the current working folder. After you select a FIL target in Step 1.1, click 1.2 Set Target Frequency. Set the Target Frequency (MHz) for the clock speed of your design implemented on the FPGA. The available range of frequencies is shown in the Frequency Range (MHz) parameter. For Intel® boards and Xilinx® boards, Workflow Advisor checks the requested frequency against those possible for the requested board. If the requested frequency is not possible for this board, Workflow Advisor returns an error and suggests an alternate frequency. For Xilinx Vivado®-supported boards, or PCI Express® boards, Workflow Advisor cannot check the frequency. The synthesis tools make a best effort attempt at the requested frequency but may choose an alternate frequency if the specified frequency was not achievable. The default is 25 MHz. At step 2, Prepare Model for HDL Code Generation, perform steps 2.1–2.4 as described in Prepare Model For HDL Code Generation Overview (HDL Coder). In addition, perform step 2.5 Check FPGA-in-the-Loop Compatibility to verify that the model is compatible with FIL. At step 3, HDL Code Generation, perform steps 3.1 and 3.2 as described in HDL Code Generation Overview (HDL Coder). FPGA-in-the-Loop Connection: FIL simulation connection method. The options in the drop-down menu update depending on the connection methods supported for the target board you selected. If the target board and HDL Verifier support the connection, you can choose Ethernet, JTAG, or PCI Express. When you select an Ethernet connection, you can adjust the board IP and MAC addresses, if necessary. Use this option for setting the IP address of the board if it is not the default IP address (192.168.0.2). The subnet address, typically the first three bytes of board IP address, must be the same as the subnet of the host IP address. The last byte of the board IP address must be different from the last byte of the host IP address. The board IP address must not conflict with the IP addresses of other computers. For example, if the host IP address is 192.168.8.2, then you can use 192.168.8.3, if available. Under most circumstances, you do not need to change the board MAC address. If you connect more than one FPGA development board to a single host computer, change the board MAC address for any additional boards so that each address is unique. You must have a separate NIC for each board. To change the Board MAC address, click in the Board MAC address field. Specify an address that is different from that belonging to any other device attached to your computer. To obtain the Board MAC address for a specific FPGA development board, refer to the label affixed to the board or consult the product documentation. Indicate additional source files for the DUT using Add. To (optionally) display the full paths to the source files, check the box titled Show full paths to source files. The HDL Workflow Advisor attempts to identify the source file type. If the file type is incorrect, you can change it by selecting from the File Type drop-down list. At step 4.2, Build FPGA-in-the-Loop, click Run this task. The HDL Workflow Advisor generates a FIL block named after the top-level module and places it in a new model. The next figure shows an example of the new model containing the FIL block. In this window, the FPGA design software performs synthesis, fit, PAR, and FPGA programming file generation. When the process completes, a message in the command window prompts you to close the window. The HDL Workflow Advisor builds a test bench model around the generated FIL block. Double-click the FIL block in your Simulink® model to open the block mask. On the Main tab, click Load to download the programming file to the FPGA. The load process may take several minutes, depending on how large the subsystem is. For very large subsystems, the process can take an hour or longer. For further troubleshooting tips, see Load Programming File onto FPGA. In Simulink, click Simulation > Run or the Run Simulation button in your Simulink model window. The results of the FIL simulation should match those of the Simulink reference model or of the original HDL code. Regarding initialization: Simulink starts from time 0 every time, which means the RAM in Simulink is initialized to zero. However, this is not true in hardware. 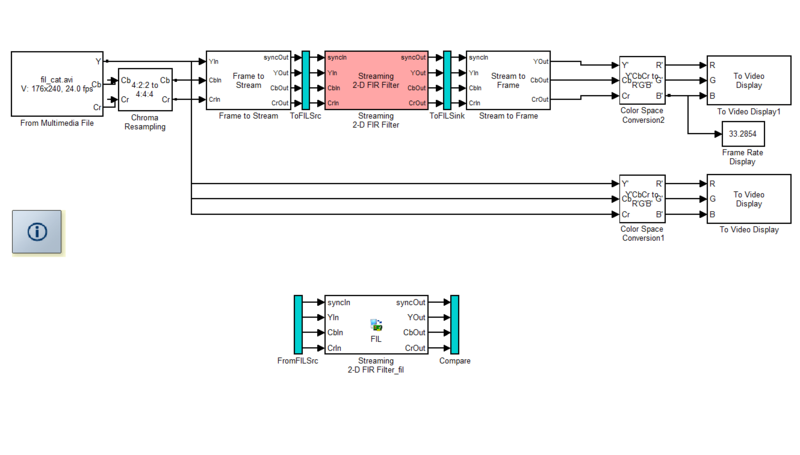 If you have RAM in your design, the first simulation will match Simulink, but any subsequent runs may not match. The workaround is to reload the FPGA bitstream before re-running the simulation. To do this, click Load on the FIL block mask.